Use Caller Number will show the caller’s phone number. Use Tracking Number will show the tracking number the caller dialed. Select a Specific Number will show a specific tracking number you select for every caller. By default, the caller’s number will be shown. Enabling this setting will ignore calls from restricted numbers are other invalid caller IDs. These calls are not necessarily malicious, but some mobile carriers will reject calls with caller ID they determine to be invalid, causing issues for agents who choose to answer calls on a mobile device. By default, “force the caller ID” is turned off. 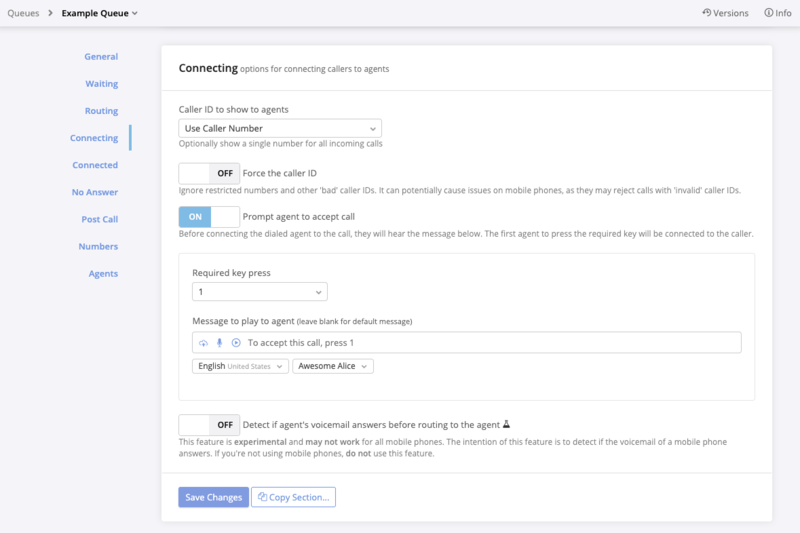 “Prompt agent to accept call” plays a message to the agent who answers a call from a queue and requires them to make a keypress before they are connected to the caller. Agent prompts are a good way to notify an agent of the source of the call and give them a moment to prepare before speaking to the caller. Requiring a keypress will also prevent calls from being routed to the agent’s personal voicemail. The default message that is played to agents is a text-to-speech prompt that says “to accept this call, press 1.” You can change this message by typing in the provided field, or upload or create your own recording to use instead. By default, agents are prompted to press 1 to accept a call from a queue. Voicemail detection is an experimental feature that will attempt to detect whether a call is being answered by a mobile voicemail. If the agents in your queue are answering calls on their mobile phones and you do not wish to require a keypress for them to answer calls, enabling this option may help prevent queue calls from going to their voicemail. This feature is experimental and may not work for all mobile phones. If you’re not using mobile phones, do not use this feature. By default, voicemail detection is turned off. The “Beep for caller” and “Beep for agent” toggles enable a beeping tone that plays for both parties when a queue call has been answered. This call notifies the caller and the agent that they’re connected and can begin talking. By default, “Beep for caller” and “Beep for agent” are turned on. If you are using post call settings to prompt an agent to enter a score for the call, you can use “hang up the caller when the agent presses *” to allow the agent to end a call for the caller without ending the call for themselves (which would skip the scoring menu after the call). The agent can press * to proceed to the scoring menu without having to wait for the caller to hang up. 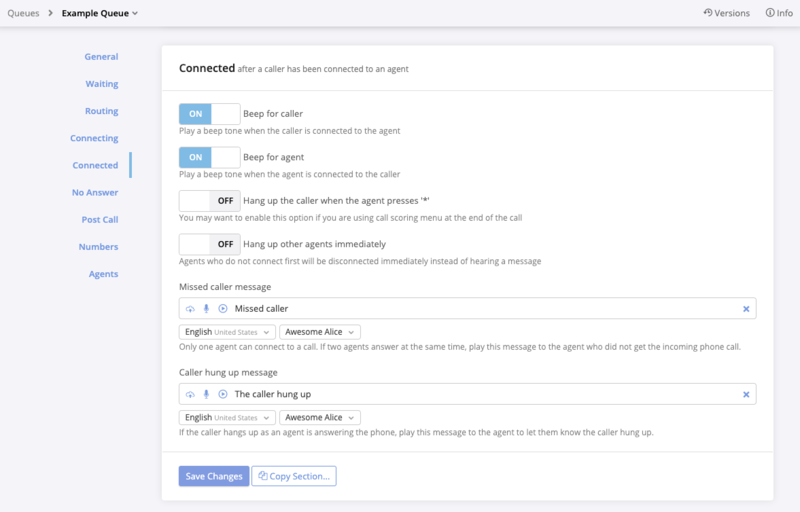 “Hang up other agents immediately” will skip the “missed call” system message that plays for agents who attempted to answer a call, but did not answer it first. By default, “hang up when the agent presses *” and “hang up other agents immediately” are turned off. These system messages play to let an agent know when someone else has answered a call first, or if a caller has hung up before the agent answered. You can customize the system message by typing in the provided fields, or upload or create your own recordings to use instead.